N THE CITY of Caesarea, about thirty miles north of Joppa, lived a Gentile whose name was Cornelius. This man was an officer in the Roman army, having command of one hundred soldiers. He was called a centurion, but we today would call such an officer a captain. One afternoon while Cornelius was praying, suddenly an angel appeared in the room and called him by name. Cornelius was frightened to see the heavenly being, and he asked, "What is it, Lord?" The angel said, "Your prayers are heard in heaven, and your good works have been seen by God and are remembered by him. Now send men to Joppa and inquirer at the house of Simon the tanner, who lives by the seaside, for a man named Simon Peter. This man will tell you what you ought to do." When the angel went away, Cornelius quickly summoned two of his household servants and one of his soldiers who also feared God. He told them about the angel's visit and command and sent them at once to Joppa on this errand. So the men started. While he slept he saw coming down from the sky a great sheet caught at the four corners. This sheet was filled with all kinds of animals, both tame and wild. As it came down to the ground a voice from heaven said, "Rise up, Peter! kill and eat." Peter looked into the sheet and saw that every kind animal was in it. Now, the Jews were very careful to eat only certain meats, as the law of Moses forbade them to eat some kinds of animals. Those forbidden ones the Jews called "common" and "unclean." When Peter saw such animals in the sheet he said, "No, Lord, I can not eat, for I have never eaten anything that is common or unclean. Then the voice replied, "What God has made clean do not call common." While he was wondering what this strange dream, or vision, might mean, the messengers from Cornelius stopped before the gate at Simon the tanner's house and inquired for Peter. And the Spirit of God spoke to him, saying, "Go down at once, for three men stand at the gate inquiring for you. Do not doubt, but go with them, for I have sent them." Now Peter was fully awake, and he promptly obeyed. When he came down to the gate he said to the messengers, "I am the man for whom you inquire. What do you ask of me?" 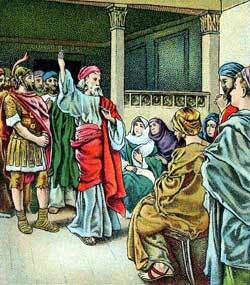 Peter took six men from Joppa, who were also believing Jews, and went with the servants of Cornelius to Caesarea. They followed the winding roadway by the seashore, and did not arrive at Cornelius' home until the fourth day after the angel had spoken to him. When they came they found a house full of people waiting to see Peter and to hear his words. Never before had Peter been entertained in the home of a Gentile. Strict Jews refused to be on friendly terms with the Gentiles, because they knew such friendships had brought idol-worship among their people in other days. But the meaning of that vision on the housetop now became clear to Peter's mind, and he willingly stepped across the threshold of Cornelius' house to greet the Gentile family who waited so eagerly for his coming. But Peter lifted him up, and said, "Stand on your feet; I also am a man like you." Peter looked into the faces of this company and said to them: "You know about the teaching of the Jews, how it is unlawful for one of them to be entertained by persons of any other nation. But God has showed me that I should not call any man common or unclean. Because of this I came to you as soon as I was sent for. And now I ask what has been your reason for calling me." Peter answered, "Now I see that God accepts people of every nation who fear him and do righteous deeds." And at once he began to tell Cornelius and his friends about Jesus. He told them how Jesus had died to save people from their sins, and that whoever will believe in the name of Jesus might be saved. While he was talking, God gave the Holy Spirit to these listening Gentiles just as he had given the Holy Spirit to the believing Jews. The six men who came with Peter were astonished when they saw how God gave the Holy Spirit to Gentiles also. They, like Peter, had always been strict Jews, and even after they believed in Jesus they supposed that salvation from sin was for the Jews only. But now they saw that God's plan of salvation was for people of every nation. Then Peter asked, "Should we forbid these Gentiles from being baptized in the name of Jesus just as we have been, seeing that God has given them the Holy Spirit, too?" And he taught them about baptism, as Jesus had commanded; then he baptized all who believed. After their baptism these Gentile believers urged Peter and his companions from Joppa to remain with them for a while and teach them more about Jesus. So they spent several days with Cornelius' household. Then they left Caesarea and returned to Jerusalem. Then he told them of his strange dream, or vision, which God had given him on the house-top in Joppa one day, and about the coming of Cornelius' servants. he told also how God's Spirit had commanded him to go with these men because God had sent them. And he said that when he and his six Jewish companions came to Cornelius' house, they found a crowd of eager listeners who believed in the true God. These listeners, although Gentiles, received his words gladly, and God gave the Holy Spirit to them just as he had given the Holy Spirit to the believing Jews. When the believers at Jerusalem heard Peter's story, they rejoiced because God's salvation was intended for people of every nation.